In my last entry, I discussed the first of seven books I happened to read on my recent vacation. In this entry, I’ll discuss the next two books I read (can’t promise the other entries will be in chronological order of reading, but hey, who’s to say there needs to be some sense of order). Many people recognize the name Jonathan Swift and some of us probably suffered through his “A Modest Proposal” at one point in our education. I say “suffer” mostly in jest because I know that’s what I did when I first came across him; mostly because he was mandatory reading and my engagement with reading was quite different then. I go back now and can certainly appreciate “A Modest Proposal” (and one can even find an a free reading at Librivox). So when Gulliver’s Travels came into my hands, I decided I should read it and found it rewarding. Here’s a book written just under 300 years ago and I was impressed how accessible it truly is. It’s not a fantastic story by any means; after all, there’s very little dialogue and some chapters can be rather drab, but on the whole, I could appreciate Swift’s criticism of humanity and society. Gulliver’s Travel is the account of a ship doctor and his four escapades into uncharted lands, each with their own unique attributes that Gulliver records. In the land of Lilliput, Gulliver is a giant among small 6-inch humans while in the land of Brobdingnag, he is as small to the natives as the Lilliputians were to him. He visits the floating island of Laputa and finishes his travels in the land of Houyhnhnms, an intelligent and utopian race of horses who eventually banish him from their society. On its face value, it’s an enjoyable story as readers learn about the different societies and how they exist, their customs, government, rituals, and beliefs. Of course, Swift wrote this as a political satire of the modern world of the early 1700s and the different European states. And a good version of this book will inform of you things that today’s common reader might not intuitively know as Swift’s contemporaries might. Still, it’s an enjoyable read because his discussions of ethnocentrism and cultural elitism still permeate in our world today. Every society fosters some belief that theirs is the superior way of life. 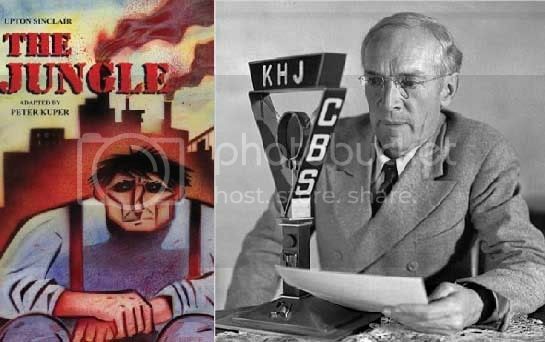 Upton Sinclair’s The Jungle was the next book I picked up and it hit me hard. I understood the influence of this book (to get some sense of it, check out this), but I never realized it would hit me emotionally. Now, those who have read it may not agree and some have seen the story as more of a propaganda piece against the more problematic issues of unfettered capitalism (that is, a pro-socialism diatribe) than an actual novel, but I think that does a disservice to what makes the book as impactful as it has been. The story begins with the marriage of Jurgis and Ona and traces their experience immigrating to the United States. They eventually end up in the meat-slaughtering district of Chicago where the entire family seeks survival in a brutal world of employment in unsafe working conditions, surplus population, and ruthless employers. Jurgis’s descent from poor but seemingly livable rural life in Lithuania to wanton criminal is heartbreaking at times. The once proud and powerful Jurgis represents the great American ideal (he continually invokes the idea of working harder to attain his financial “freedom”) clashing with the stark reality of life in the late 19th and early 20th century for millions of Americans. Knowing the larger truth of working conditions to which Sinclair spoke, made Jurgis’s plight more powerful. Jurgis may never existed but inevitably many have walked similar paths and still do. Inevitably, there were parts of this book that I had trouble digesting (pun, intended). Peter Kuper does a good and stark comic version of it, that if read deliberately can evoke many of the emotions found in the book; though I don’t think it does the book full justice since so much of Jurgis’s plight is vested in a combination of Sinclair’s vivid descriptions of the squalid living conditions, brutal work environments, and emotional desperation of his characters. Both books fall into that category of classics that everyone knows but few have ever actually read. If asked, I could have said a few things about both books right off the top of my head without having ever read them. Their influence permeates through world culture. Swift’s critical approach to the world is still well felt in shows such as King of Hill while Sinclair’s book sparked a variety of changes and regulation within different industries while also being invoked time and again wherever exploited workers have dealt with repressive conditions. But more importantly for my reading enjoyment, they were both books that once I got into the rhythm of, found myself enveloped in and enjoyed. What “classics” have you read that make it self-evident by story’s end why they became “classic?” That is, what books have you finished and felt like, “Now, I understand why it’s a classic”? What “classics” have you made it to the end of and feel like it didn’t fulfill your expectation of “classic”? (My experience with this is Catcher in the Rye by J.D. Salinger; I’ve read it 3-4 times and I still don’t know what all the fuss is about). I have to admit that I have yet to see any merit in Hemingway, and very little in Steinbeck. I at least 'get' why Steinbeck is considered a Classic author, but he's so painful to read that it's not worth it to me. congrats Jess, your'e the first to post on my blog ;) I'm not a hugh fan of Steinbeck either; I've had trouble getting into The Grapes of Wrath on several occasions, but I'm hugely fond of Of Mice and Men...maybe it's because I was primed for it with the Bugs Bunny cartoons ("Oh boy, oh boy, I found me a little bunny rabbit and I'm gonna call him George!" - http://www.jogyjogy.com/watch.php?id=19e09). I also liked the subtlety of "The Chrysanthemums" as a short story.